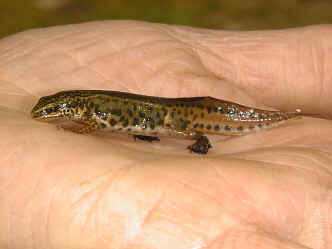 This is Britain's smallest newt, with a length of up to 9cm. They breed in fresh water ponds and lakes. 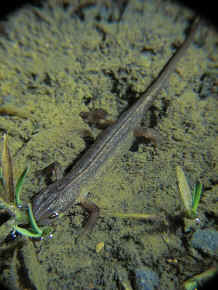 The adults can often be found in puddles and under log piles and stones, where conditions are cool and moist. The South West of Britain is a stronghold for this species, while they are absent from Ireland. The adult males (left) can be distinguished from females by their black, markedly palmate (webbed) back feet. The females also have palmate back feet, but this characteristic is much less marked and the colour is lighter. In the breeding season, the males also have a black spike on the end of their tail (just visible in the picture at left). The female lays eggs singly, folded into the leaves of water plants. The male courtship ritual involves him vigorously fanning his tail, which is curled to one side. The eggs develop into tadpoles in the water. 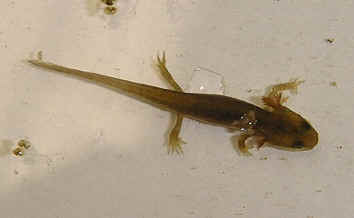 Newly hatched newt tadpoles lack legs and look just like small fish (although of course they are amphibians and not fish.) On close inspection they can easily be distinguished from fish by the feathery external gills on either side of the head. Legs develop later as the tadpoles metamorphose into adults. Development of the newt tadpoles is much slower than that of frogs and toads and they can often be found in ponds very late on in the year. Like frog and toad tadpoles, newt tadpoles have a high mortality. Only a small percentage will reach breading maturity. Learn lots more about British Newts!